Michigan battled the higher ranked and more talented Spartans for the entire forty minutes but in the end, like we have seen time and again this year, Michigan came up one basket short. 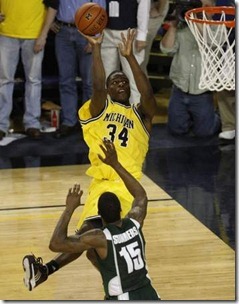 The bottom line is that Michigan didn’t make their shots in the clutch and Michigan State did. After DeShawn Sims airballed a three pointer from the corner, Kalin Lucas calmly knocked down a 15 foot jumpshot from the elbow to put the Spartans ahead for good. The final two minutes were the killer for Michigan. Leading by three with the ball, Michigan got a terrible Stu Douglass look with time running down on the shot clock that was airballed. On the ensuing defensive possession, Draymond Green grabbed an offensive rebound from right over Douglass’ head for an easy put back. 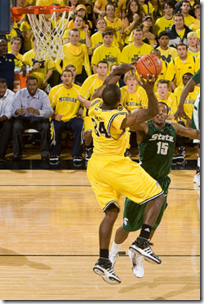 On Michigan’s next possession DeShawn Sims got a wide open look from three point range that he airballed. The miss was painful but I have a tough time criticizing this shot because Sims had made his last two triples and was three of four on the night. The biggest problem with this possession is that Michigan needed to get a shot off sooner, if they had they could have left themselves more time on offensive after State’s made basket. I think this was the plan, with the hope that Harris would take the ball all the way but Michigan reset the offense and had Douglass penetrate and kick to Sims. On the final possession, Beilein went with the 1-3-1. I assume the thinking here was to mess up whatever play MSU had set and it seemed to work, for about 15 seconds. Then Lucas found a gap and hit a wide open shot that was eerily similar to one that he hit from the other elbow versus Michigan’s 1-3-1 with 5 minutes to play. Beyond the final stages of the game, Michigan really couldn’t make any shots. They shot just 32.8% from the field (eFG% 38.8%). Three point attempt after three point attempt clanged off the rim for Michigan. Everyone without Sims on their jersey combined to shoot 4 of 24 from three point range, 16.6%. If they could have shot even close to their season average they would have won this game easily. It’s tough to beat anyone when you shoot that poorly. It’s even tougher to beat a top 10 team. Still, Michigan caused enough turnovers (30% of MSU’s possessions) that they were actually leading throughout much the contest. Michigan has been playing much better defense than they were earlier this year and although it was a couple months too late, it was great to see the defensive intensity today. Thanks mostly to the turnovers, Michigan held Michigan State to only .928 points per possession. The only teams who have done better against Michigan State this year defensively were Texas and Wisconsin. DeShawn Sims and Manny Harris weren’t particularly efficient but they were really all that Michigan had going for them. They nearly carried Michigan to victory without any help from the so called role players, who were invisible on the offensive end. Stu Douglass, Zack Novak, Darius Morris, and Laval Lucas-Perry were nothing short of brutal. If just one of those guys manages to hit more than one three point shot, Michigan would have been in great shape. A lot is made about how Michigan shoots too many three pointers, and they took exactly half of their shots from three point range last night. However the real issue is that, beyond Harris and Sims, no one else has any ability to create or make shots inside the arc. There is no one else that can penetrate, no one else with any midrange game, no one else with a back to basket game, and no true distributor. The other three players on the floor have to take some shots and three point range is really the only place that Michigan’s complementary players are comfortable shooting. At times this year, questions of Michigan’s effort have crossed my mind. Last night there were no such questions, Michigan gave everything they had for forty minutes. They just weren’t good enough to come away with the win. Michigan is now 10-10, and if you were to ask for a worst case scenario before the season it might not have even been this bad. Two final things. First, I wouldn’t be surprised to see Michigan State go “big” the next time around. The Nix and Roe lineup had great success and I think they would benefit from going with bigger lineups at times. Second, I wish my article about Michigan State having the “killer instinct” wasn’t true, sadly we got a large dose of it last night. DeShawn Sims: Peedi wasn’t at his best, scoring 19 points on 7 of 18 (3-5 3pt) shooting with 5 rebounds. He couldn’t hit any of his shots near the hoop and despite hitting a couple threes, he airballed the one the corner three that could have sealed the game. Sims has played some of his best basketball over the last month, and despite it being a couple months late, it would be great to see him finish the season at this level as well. Manny Harris: Harris was excellent down the stretch. He had 16 points on 5 of 13 (1-5 3pt) shooting with 5 steals, 5 assists, 4 rebounds, and 0 turnovers. My only complaints are about a couple questionable three point attempts and that I would have liked to see Harris keep the ball on the possession that resulted in an ugly Douglass jump shot. Otherwise Harris was phenomenal and he responded to Michigan State’s run in the middle of the second half with his own. Stu Douglass: Stu has begun penetrating the lane but his fear of taking the ball all the way to the hole for a layup is maddening. Instead of getting fouled or making a layup, Douglass typically ends up trying to make Steve Nash-esque passes that tend to be intercepted. 1 of 5 three point shooting with 3 turnovers is simply not good enough. Laval Lucas-Perry: Laval played decent defense but he BADLY missed a couple wide open looks from three point range. He is supposed to be a shooter and if he’s going to be a shooter he has to hit open shots. Zack Novak: Novak had 5 of Michigan’s 6 offensive rebounds (how many of his wild tips counted as offensive boards?). The offensive rebounds were nice but like Douglass and Lucas-Perry, it’s time for Novak to start hitting some shots. Darius Morris: He missed his only three point shot attempt off the side of the backboard. His length is a nice asset on defense but he is just not a threat on the offensive side of the ball. Zack Gibson: Gibson had a nice shift in the first half but got dunked on in the second. Anthony Wright: Wright hit a three but he was still the same old poor defender and mediocre rebounder. Jim Burr: It was Burr’s 7th Michigan game this year but he finally wore down and busted his back. That 32nd year officiating will getcha.